Many varieties are cold hardy to -10F (- 23C) when well rooted in the garden. Grow varieties described as soft spring wheat in spring, but choose hard winter wheat for fall. 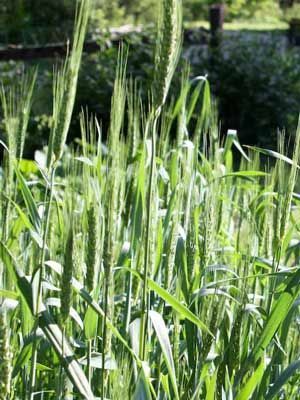 When using wheat to improve very poor soil, mixing a balanced organic fertilizer into the soil before planting will give better results. Winter Field Beans, Hairy Vetch and Winter Peas. Sow in late summer or early fall for an overwintered crop. Spring wheat can be planted while the soil is still cool. Broadcast seed into cultivated soil so that the seeds are about 3 inches (7 cm) apart and one-half inch (1 cm) deep. No thinning is required. Increase spacing to 8 inches (20cm) apart when growing wheat with other cover crops. Primarily grown to increase organic matter, break up dense subsoil and crowd out weeds. Makes a beautiful show in spring. Deer often nibble wheat grown in winter.